Pilates (pronounced Pi-LAH-teez) is a system of exercises developed by Joseph Pilates that strengthens the body’s inner core while increasing its flexibility resulting in improved overall health. How does one start a Pilates practice? The best way to start a Pilates practice is to take the Pilates Foundations program. The Pilates Foundations program teaches the student the five basic principles of Pilates and the essential mat exercises. Pilates Foundations will properly prepare the student for enrolling in the machine-based Reformer program. Pilates Foundations is offered on a continuous basis and runs for eight weeks. Pilates mat-based classes are drop-in with no registration required. Mat classes are separated into Level 1 and Level 2. Level 1 is for the beginner to intermediate participant and Level 2 is for the intermediate to advanced participant. Pilates is also offered on specially designed machines: chair and reformer. 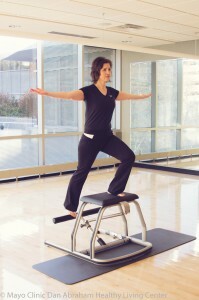 Pilates chair classes are drop-in with no registration required. These classes include Pilates Balance & Control and Pilates Sculpt. Pilates Reformer program requires registration. It is offered on a continuous basis and run for eight weeks.